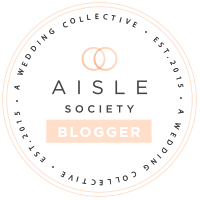 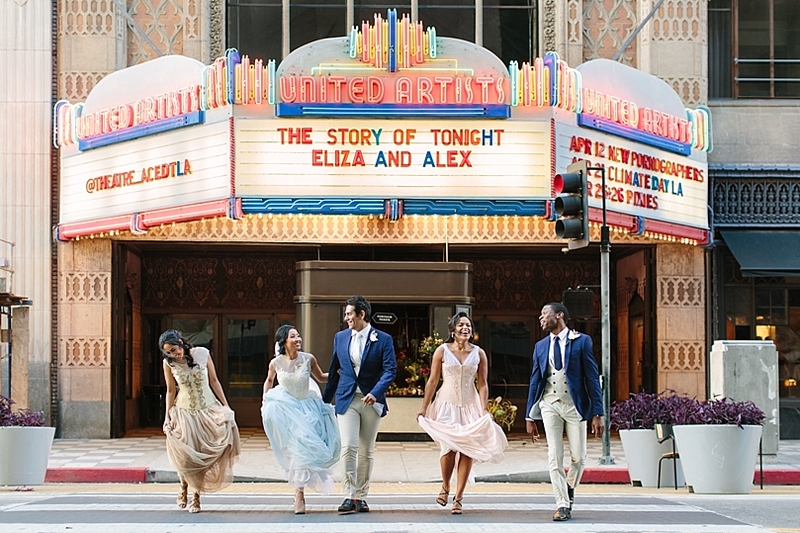 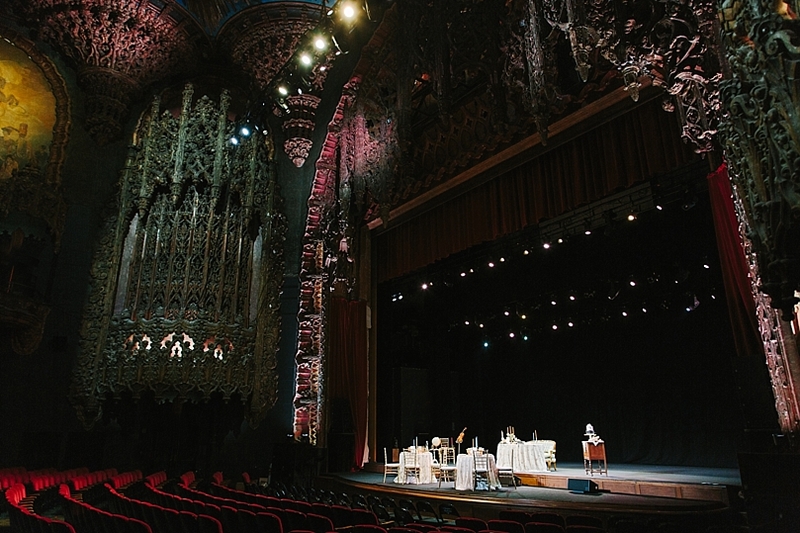 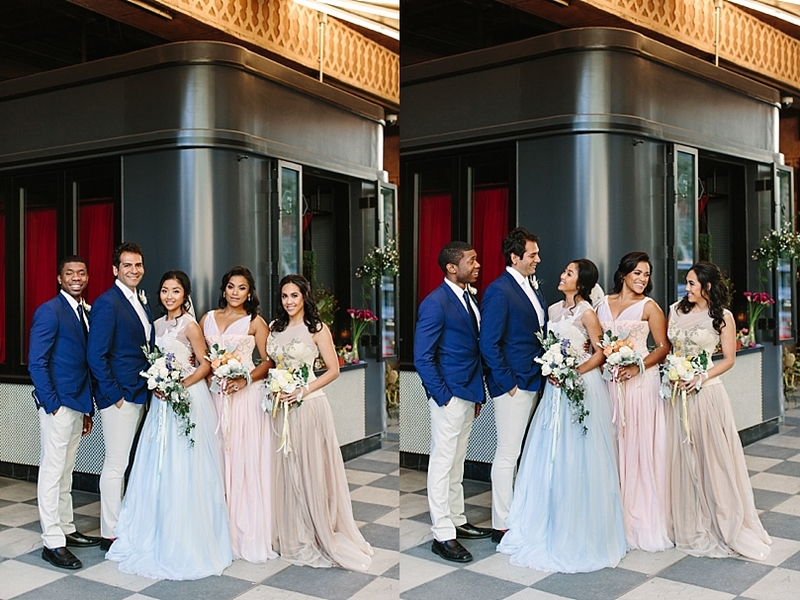 "Planned and designed by Fandom Affairs, this styled wedding took place at The Theatre at Ace Hotel in downtown Los Angeles. 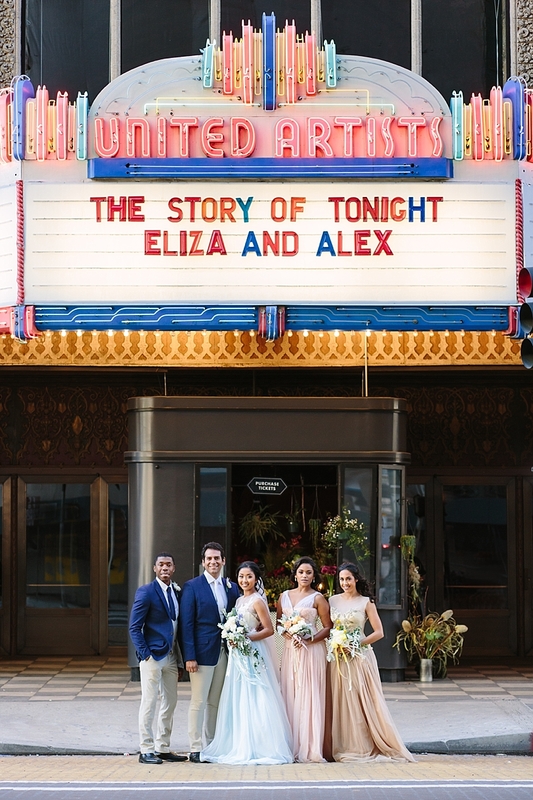 We can’t think of a better place to have a Hamilton wedding than on a stage in a gorgeous historical theatre! 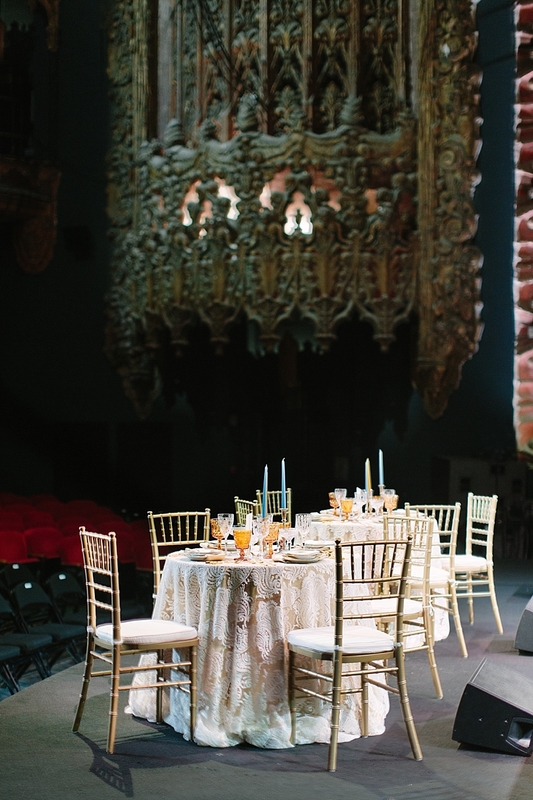 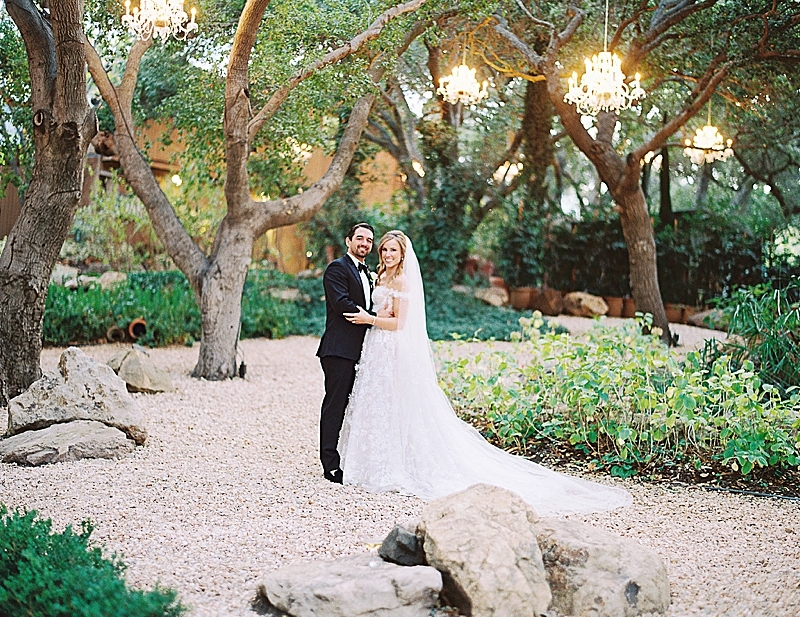 Mary Costa Photography beautifully captured this romantic and chic interpretation of this musical phenomenon. 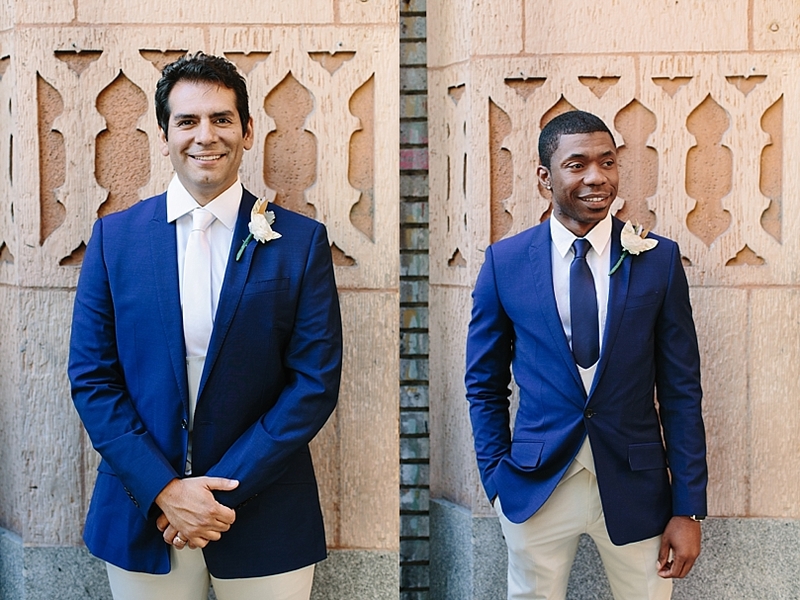 The Men’s Attire was modeled off the soldiers uniforms featuring a navy blazer, khaki pants, and a double breasted waistcoat. 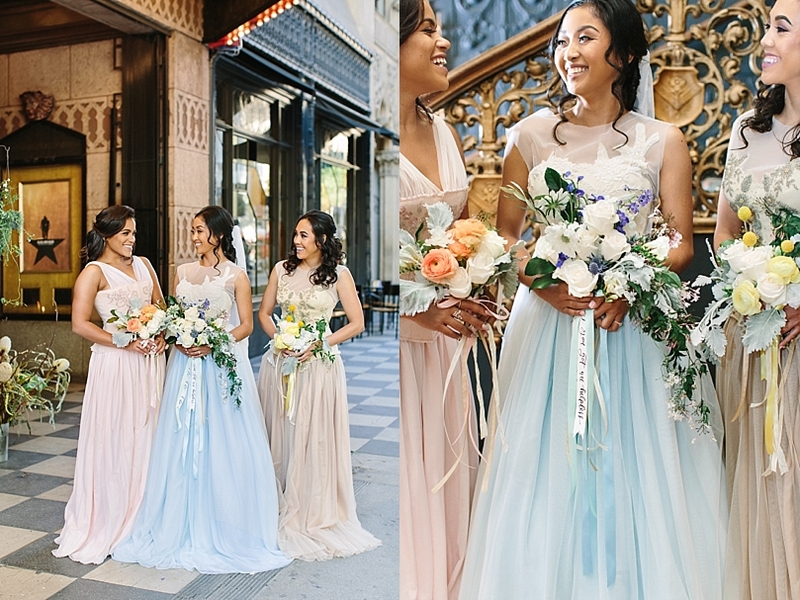 The gorgeous gowns by Deborah Lindquist Eco Couture feature colorful English net skirts reminiscent of each Schuyler sisters’ signature color, while the wool beaded bustiers provided a subtle nod to a more historical period silhouette. 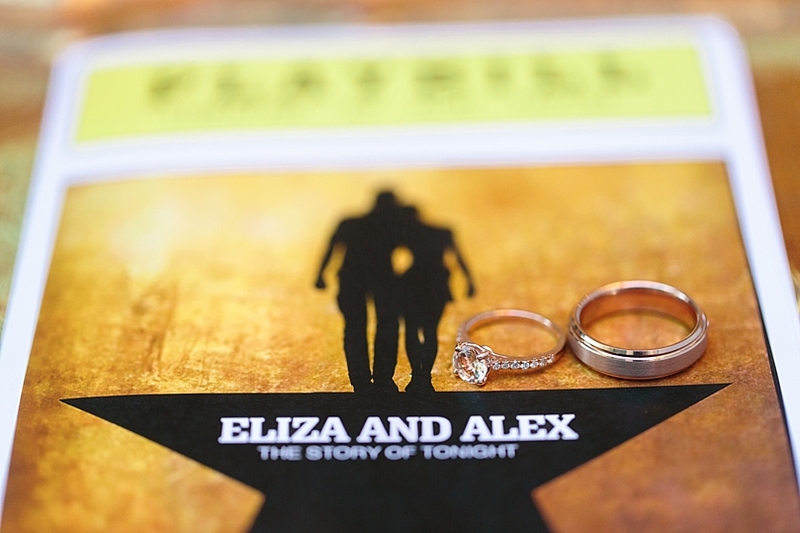 So many thoughtful details in this shoot nod to the production. 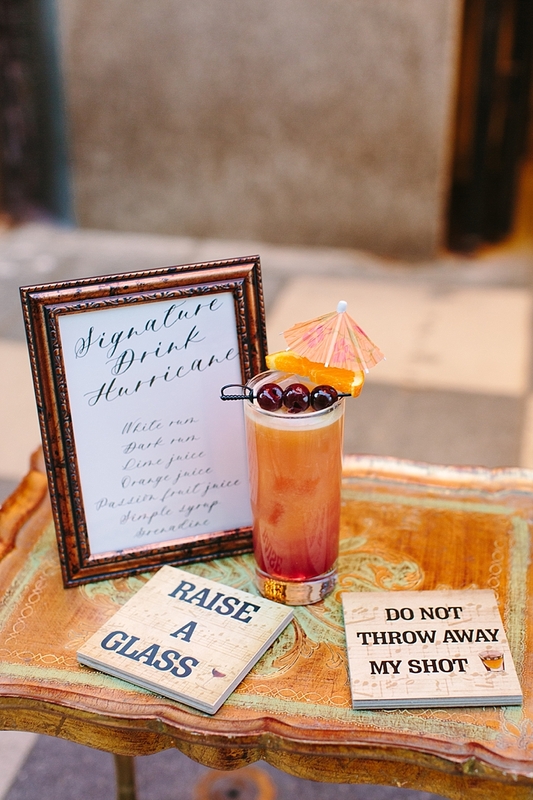 From “The Story of Tonight” marquis, the lyrics of “Helpless” written on the Bride’s bouquet, to the “Hurricane” signature cocktail with “raise a glass” and “do not throw away my shot” drink coasters. 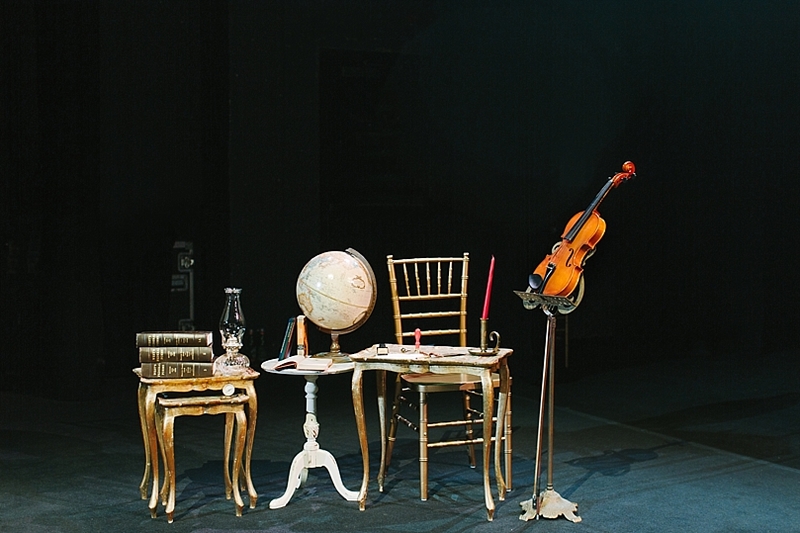 There isn’t a single element that hasn’t been translated from the show. 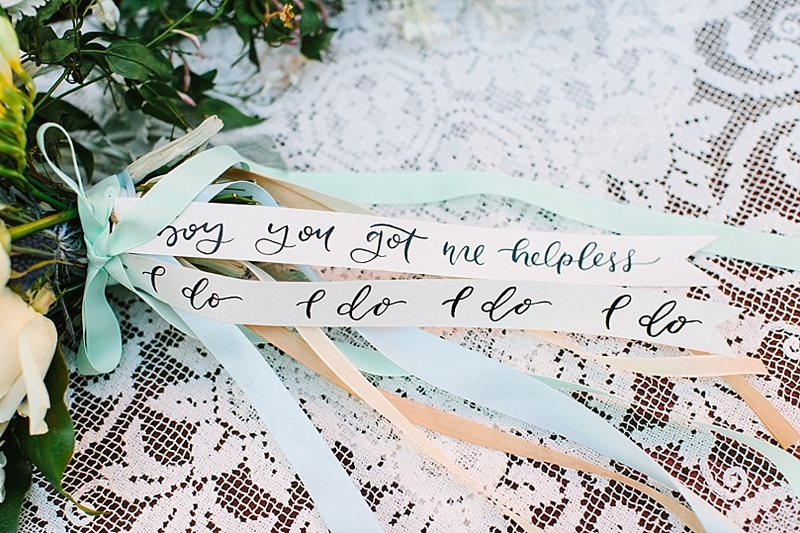 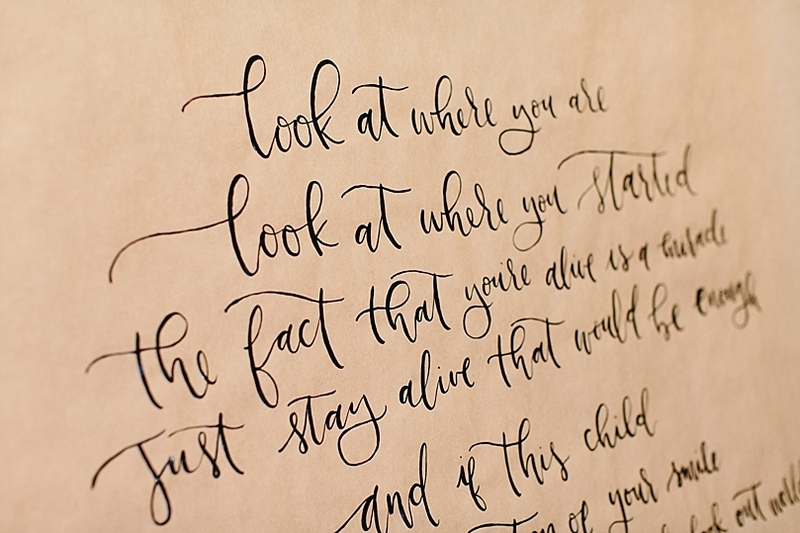 The ceremony design featured an 8‘ by 4’ parchment scroll with the lyrics of “That Would Be Enough” written in calligraphy by Ink and Nod Designs. 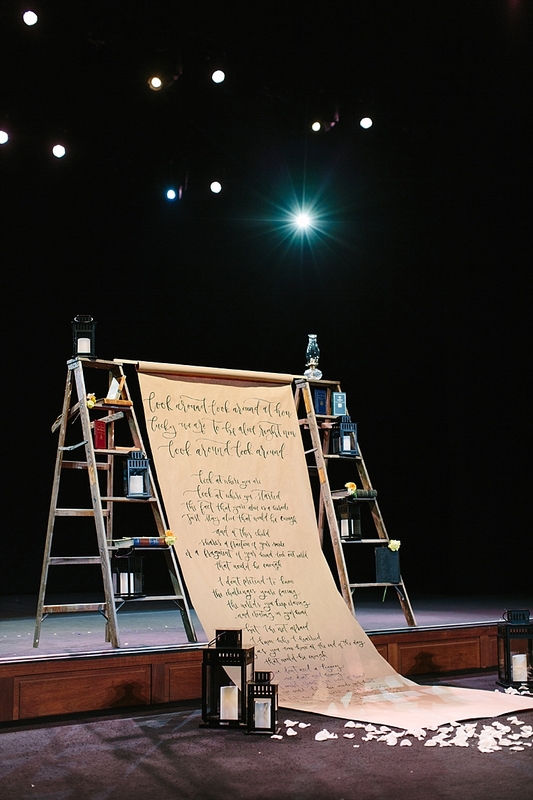 The scroll was anchored by wooden ladders to look like set equipment with hardcover books of The Federalist Papers, Constitution, and The Declaration of Independence peaking out on the steps. 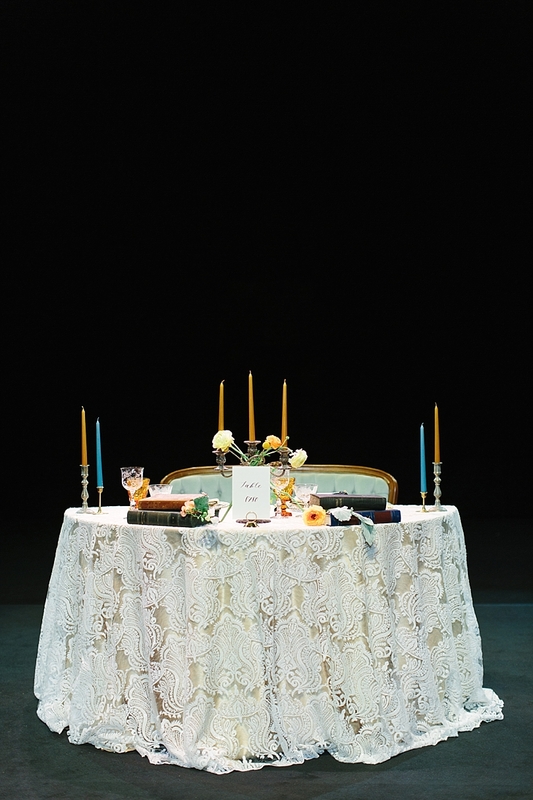 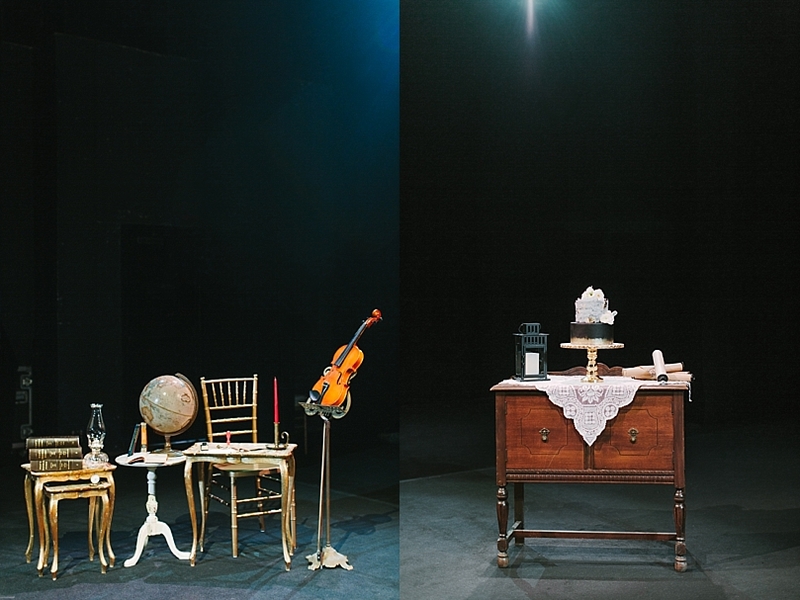 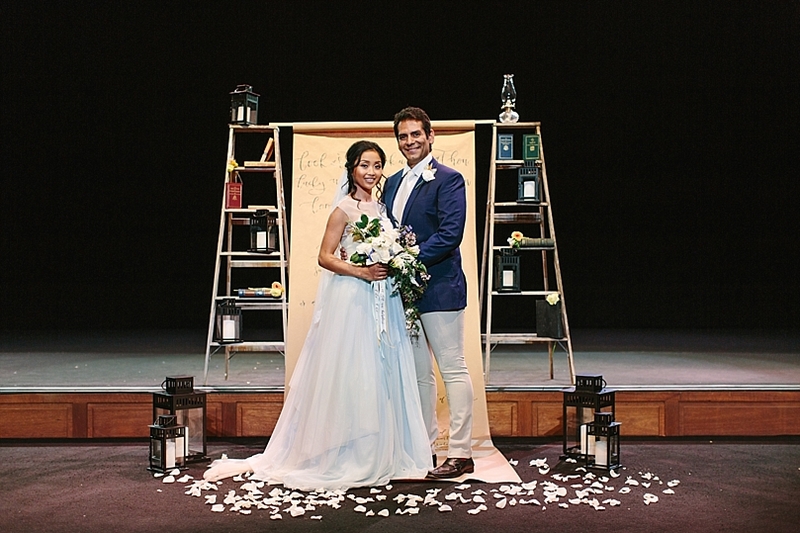 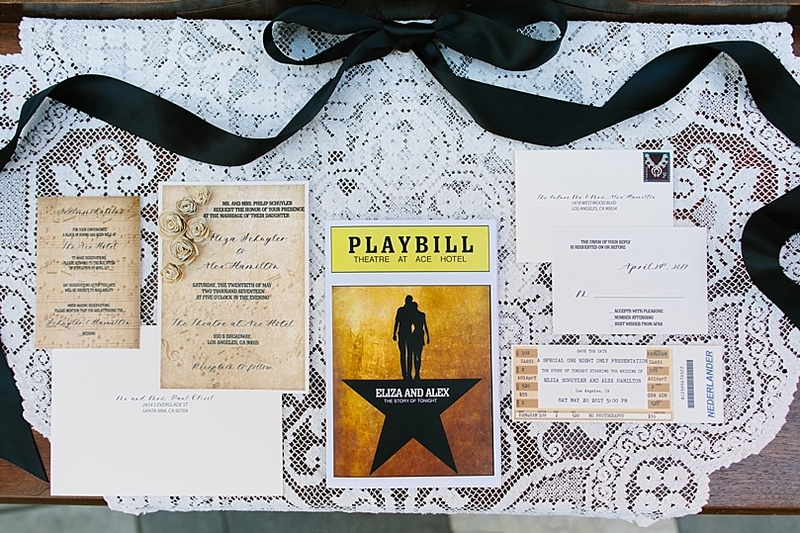 The stationery, designed by Boxed Wedding Invitations, was inspired by a real theatre going experience starting with “A Special One Night Only Presentation” Save the Date ticket. 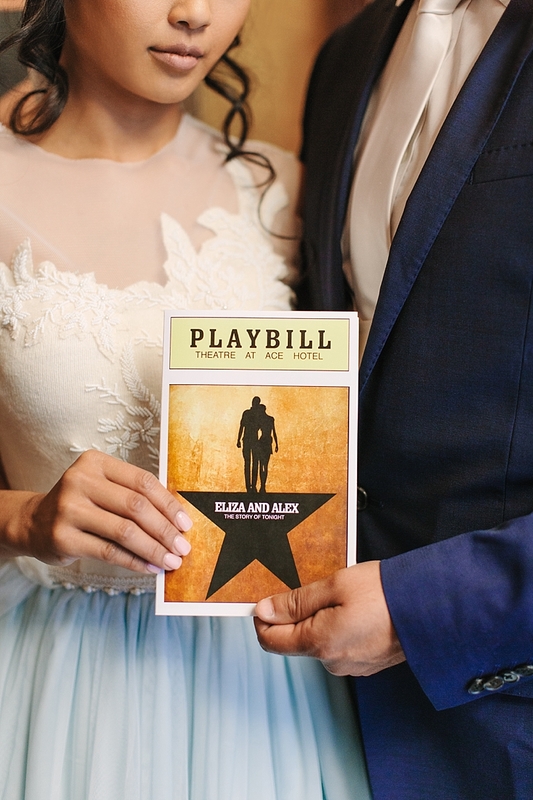 The wedding program resembled a broadway playbill complete with the Bride and Groom’s Hamilton inspired logo and a full scene breakdown and cast list inside. 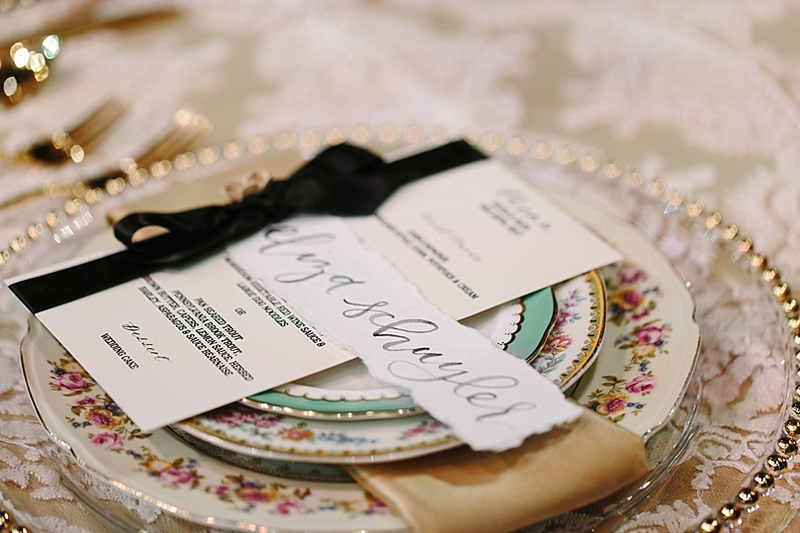 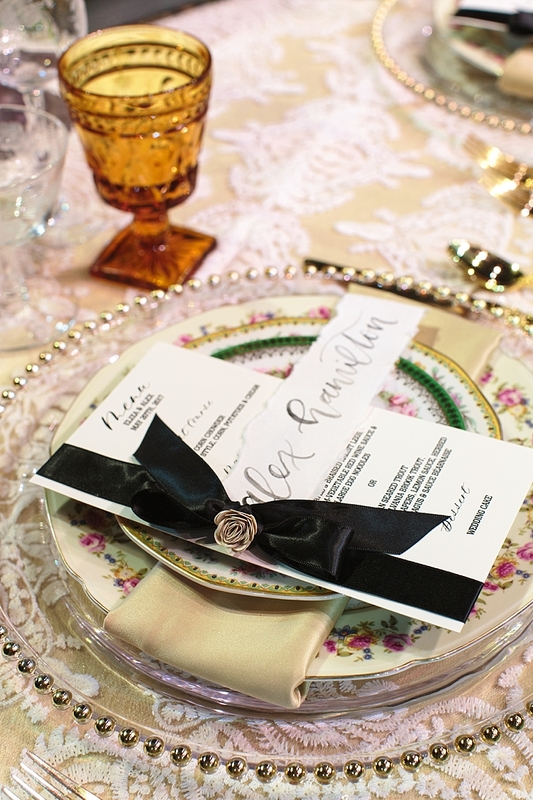 Tying it all together was a beautiful vintage invitation suite with musical note motifs and sheet music paper florals. 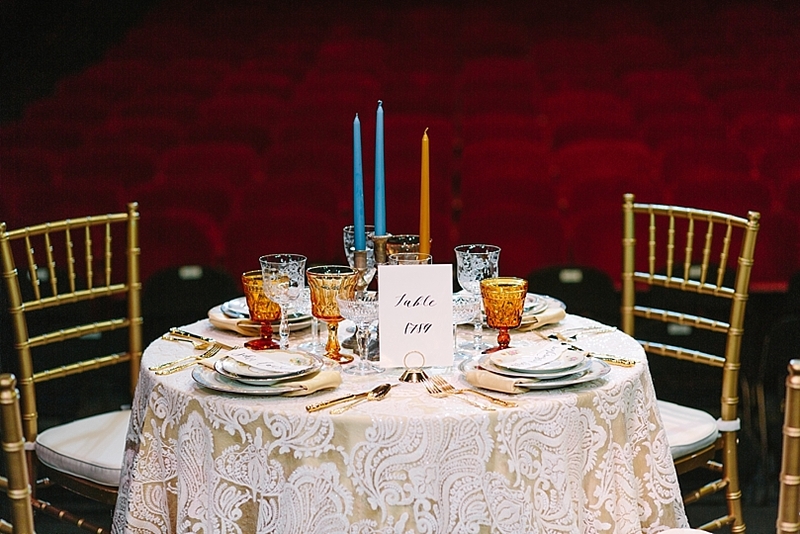 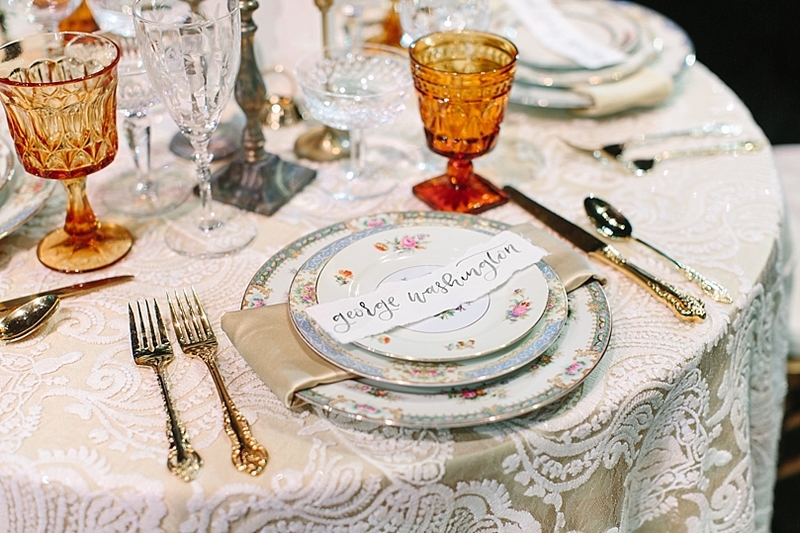 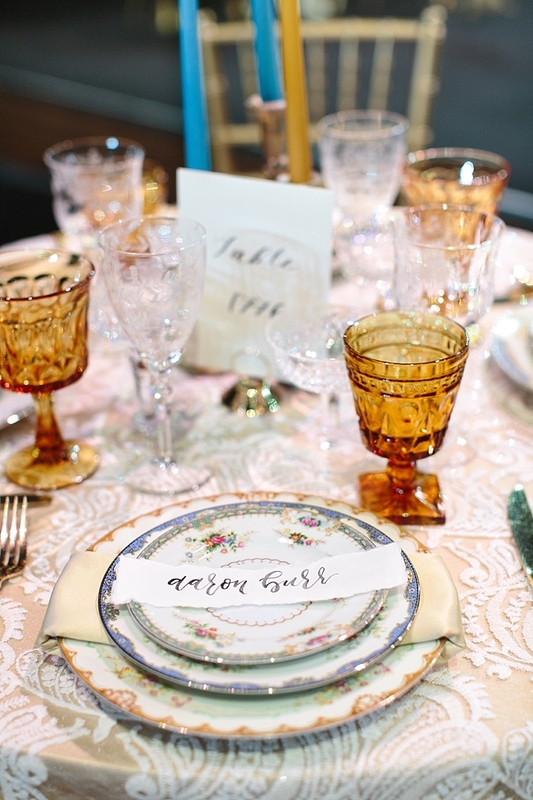 Beautiful gold tablecloths with lace overlays embellished the reception tables. 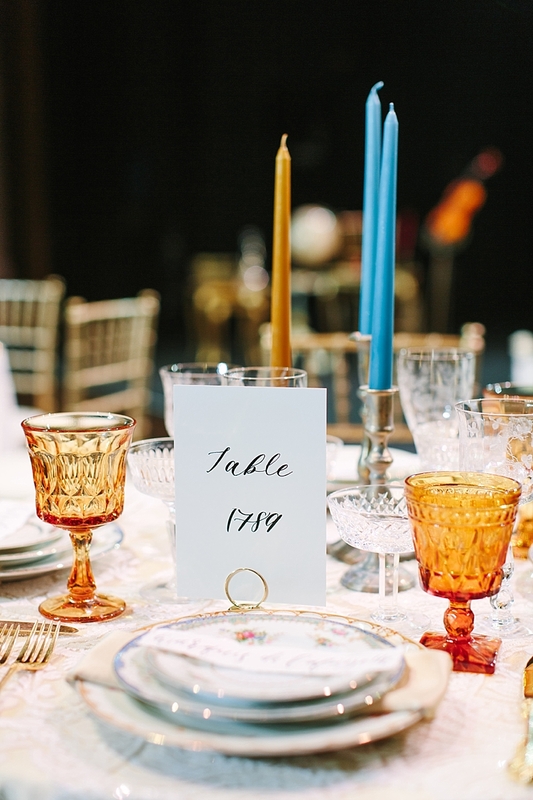 Significant years throughout the show such as 1776, were used as table numbers. 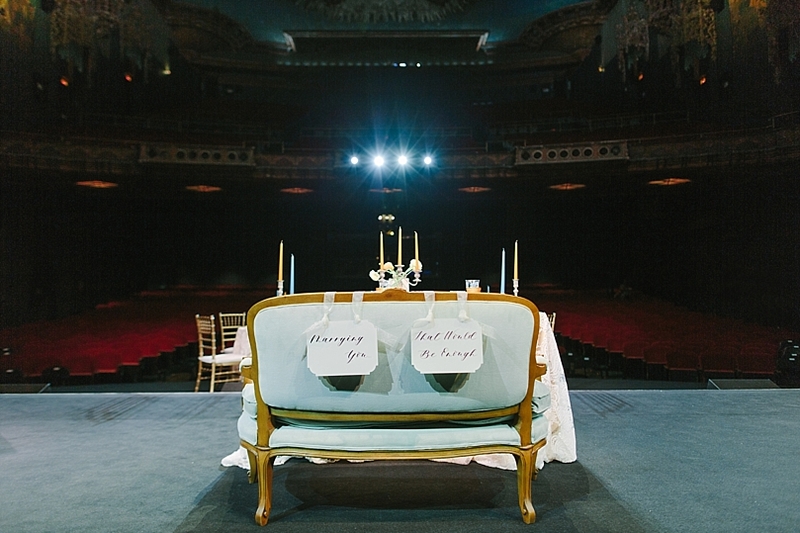 1780, the year Eliza and Alexander met, was saved for the sweetheart table, while chair signs that read “Marrying You…That Would Be Enough” were displayed on the back of a beautiful tufted mint sofa. 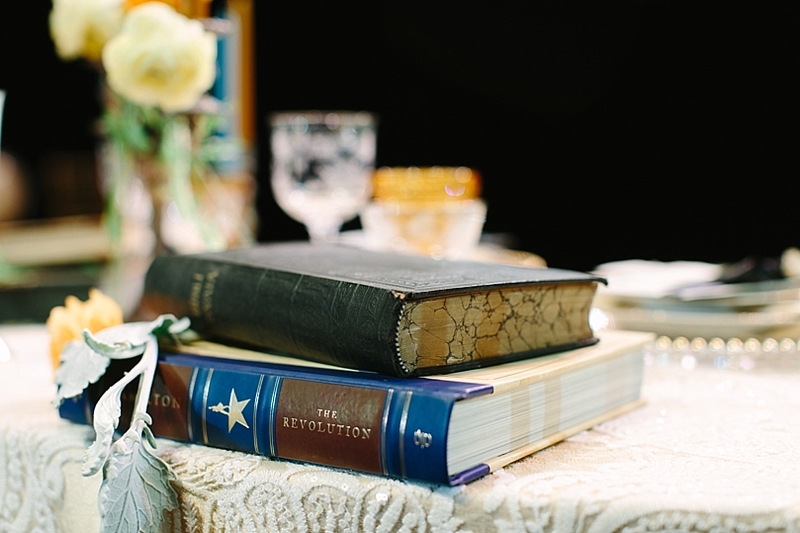 The centerpieces were comprised of brass candlesticks with colored taper candles, loose florals, and vintage books. 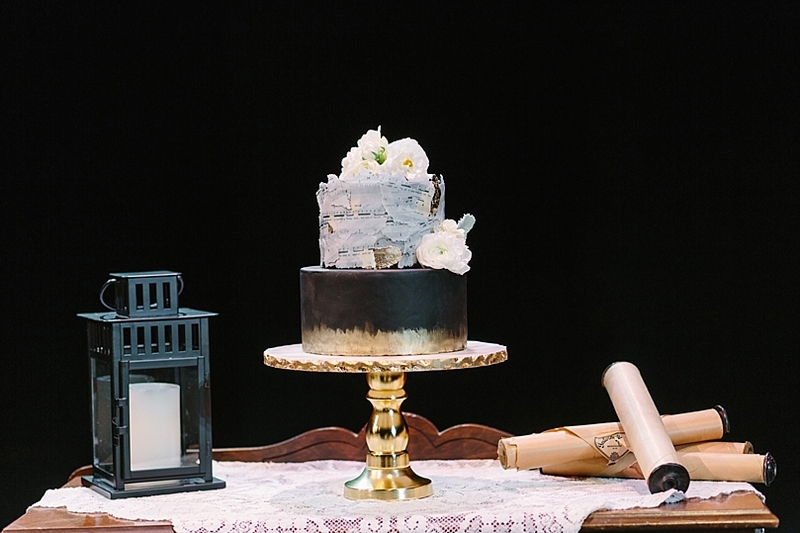 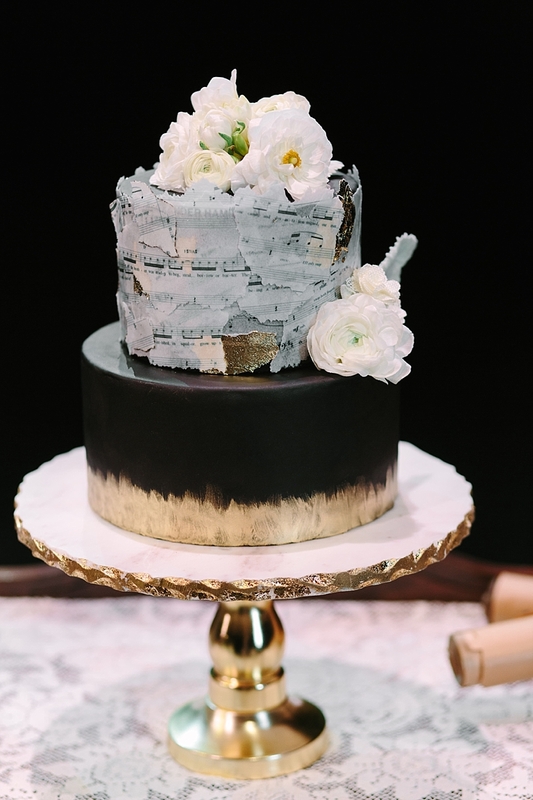 Set atop a beautiful vintage buffet table from Provenance Vintage Rentals, the two tiered cake by Nicole Bakes Cakes featured black fondant with gold brushstrokes and torn wafer sheet music from the actual musical score. 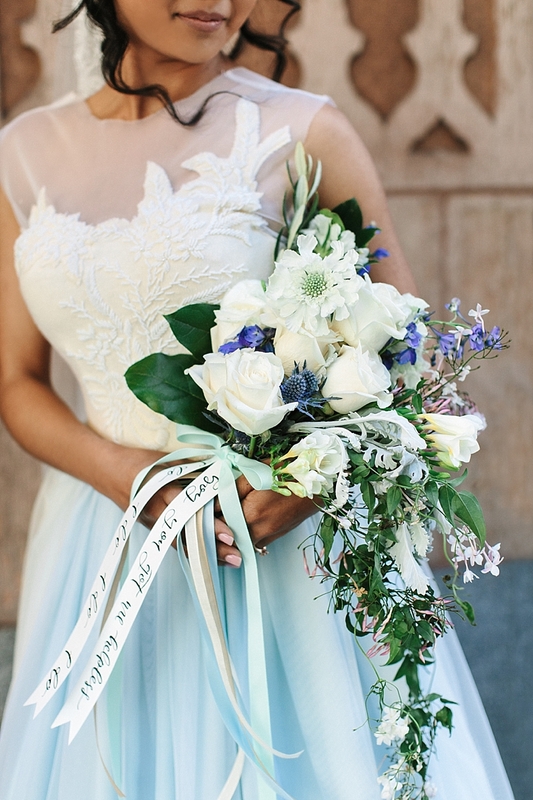 The colorful bouquets by La Rosa Que Creció are inspired by an English garden accented with satin ribbons that correspond with each Schuyler sisters’ signature color. 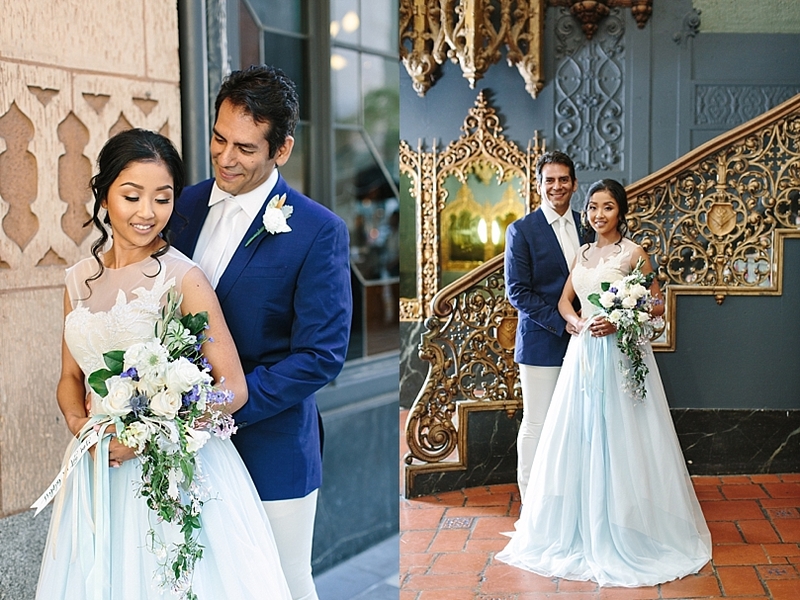 The boutonnière florals were accented by sheet music shaped into leaves."